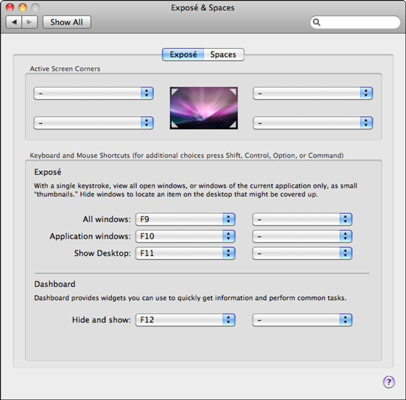 Mac OS X Snow Leopard enables you to personalize Exposé and Dashboard settings. You can use Exposé to view all the application windows that you’re using at one time so that you can select a new active window. Or, you can move all windows aside so that you can see your Desktop. Dashboard presents a number of mini-applications (or widgets) that you can summon and hide with a single key. Spaces makes it easy to create multiple desktops that you can switch between, each of which has its own set of preloaded applications. To access these settings, click the Gear icon on the Dock to open System Preferences and then choose Exposé & Spaces. Active Screen Corners: These four pop-up menus operate just like the Hot Corners/Active Screen Corners in the Desktop & Screen Savers pane, but they control the operation of the Snow Leopard Dashboard and Exposé features. Click one to specify that corner as an All Windows corner (which displays all windows on your Desktop), an Application Windows corner (which displays only the windows from the active application), a Desktop corner (which moves all windows to the outside of the screen to uncover your Desktop), or a Dashboard corner (which displays your Dashboard widgets). Note that you can also set the Screen Saver Start and Disable corners from here. Keyboard and Mouse Shortcuts: Click each pop-up menu to set the key sequences (and mouse button settings) for all three Exposé functions as well as the Dashboard. Enable Spaces: In order to use Spaces, select this check box. Show Spaces in Menu Bar: When this check box is selected, Snow Leopard displays the Spaces desktop number you’re currently using in the Finder menu bar. 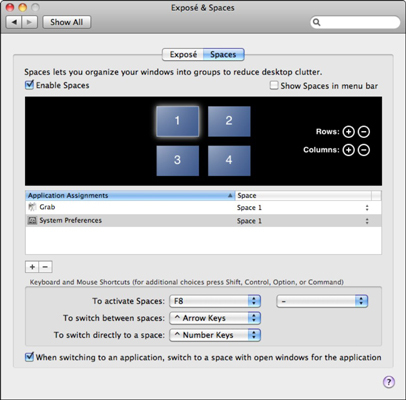 You can click the number in the menu bar to switch to another Spaces desktop or to open the Spaces Preferences pane. Rows buttons: To add a row of Spaces desktops to the Spaces grid, click the Add button with the plus sign. (By default, Spaces starts with two desktops enabled, so new rows and columns are numbered beginning with three.) To delete a row, click the Delete button (which bears a minus sign). Columns buttons: To add a column of Spaces desktops to the Spaces grid, click the Add (plus) button. Click the Delete (minus) button to remove a column from the grid. If you choose to remove a column or row, Snow Leopard alerts you that the bindings on the deleted desktop(s) will be reassigned. Add/Remove Application: Click the Add Application button (the button with the plus sign under the Application Assignments list) to add an application to one of your Spaces desktops. You can select which desktop should include an application by clicking the up/down arrows next to the Space column for that application’s entry. Just click the desired desktop from the pop-up menu that appears. To remove an application, click it in the Application Assignments list to select it and then click the Remove Application button (which sports a minus sign). To add an application to all your desktops, choose Every Space from the pop-up menu. Keyboard and Mouse Shortcuts: Click each pop-up menu to set the key sequences (and mouse button settings) for all three Spaces functions. As with Dashboard and Exposé keyboard and mouse shortcuts, you can press Shift, Control, Option, and Command keys while the box is open to display modified choices. When Switching to an Application: When selected, this check box allows you to switch applications between Spaces desktops using the Command+Tab shortcut. Snow Leopard will jump to the desktop that has an open window for the application you choose, even if that desktop is not currently active.